In the days of XAML Builds in TFS, the build would rather handily update the work item with the appropriate “Integration Build” value… so you knew which release would include your fix. Happy days. 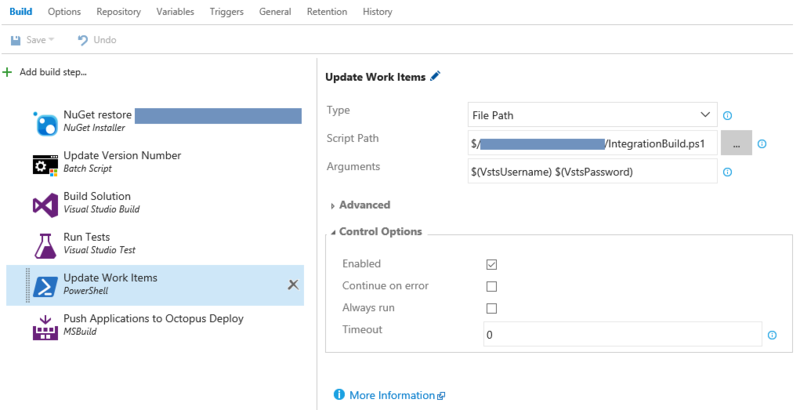 Along came vNext builds in TFS / Visual Studio Online / Visual Studio Team Services, which solved all of the pain of setting up and maintaining builds, but which also didn’t update the “Integration Build” value on the work items. 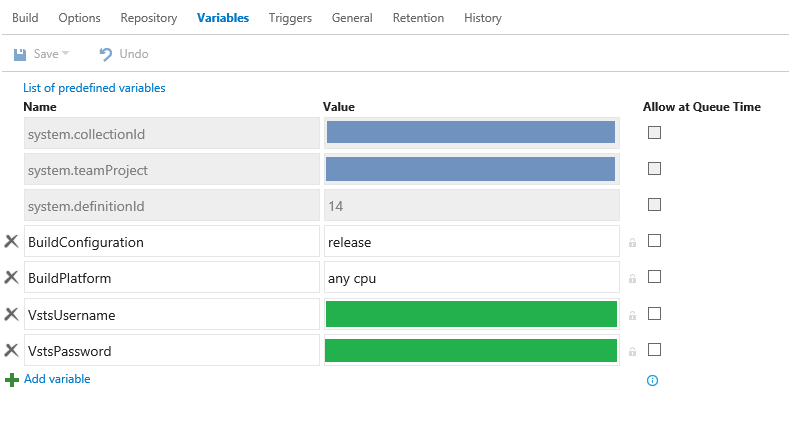 The good news is, we can handle this in vNext builds using the Team Services REST API for Work Items. You can generate a special token to use for this – so you don’t need to use your actual account. You’ll use this token to talk to the REST API. You’ll need to add the following PowerShell script into your code repository, so it is available during the build. NOTE: If your work items are not in the same collection as your code and build, you can still follow along using this alternate PowerShell script. $WorkItemAddress = $collectionAddress + $project + "/_apis/build/builds/" + $buildId + "/workitems?api-version=2.0"
Write-Output "Getting Work Items from $WorkItemAddress"
Write-Output "$workItemCount work items are available to update"
$workItemUpdateAddress = $workitemUrlArray[$i].url + "?api-version=1.0"
This script will dynamically obtain the base addresses of your team collection and will get the work items related to the build, and then update the “Integration Build” value. Edit your vNext build and choose the “Variables” section. Add a variable named “VstsUsername” with your username and a variable named “VstsPassword” with your newly minted token. Now you can add a PowerShell build step to your vNext build, calling the PowerShell script and passing the VSTS Username and Password. You can make that visible on your board, it appears in the work item details, and you can also use it in your queries and reports. This slightly more looping example will traverse collections to update the work item even when the code and build are in another collections – as long as they are part of the same account. $changesetAddress = $collectionAddress + $project + "/_apis/build/builds/" + $buildId + "/changes?api-version=2.0"
Write-Output "Getting Changes from $changesetAddress"
$workItemsAddress = $collectionAddress + "_apis/tfvc/changesets/" + $changeId + "/workItems"
Write-Output "Getting Work Items from $workItemsAddress"
Write-Output "$workItemsCount Work Items found"
$workItemUpdateAddress = $collectionAddress + "_apis/wit/workItems/" + $workItemId + "?api-version=1.0"
Write-Output "Patching $body to $workItemUpdateAddress for $workItemId"